Growing from seed potatoes is easy and really rewarding and there are many different varieties available. Seed potatoes are normally categorised by first earlies, second earlies, maincrop and salad varieties. Allow your potatoes to ‘chit’ (sprout) before planting. You can do this by placing them in a shallow tray (egg boxes are ideal) with any shoots facing upwards. Position the tray in the light and protect from frost and extreme heat. Leave the potatoes for roughly six weeks to allow sprouts to grow to about 1.5-2.5cm (0.5-1 inch) tall. Once the seed potatoes have reached this point, you are ready to plant them out, either in the ground or in an growbag, positioned on its side, so it stands vertically, with the top cut off. 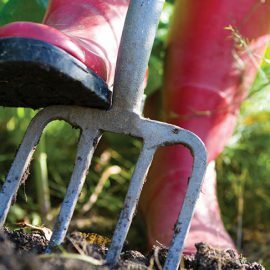 Choose a sunny spot (avoid frost pockets) and dig to break down the soil, removing any clods. Dig a trench in the soil 15cm (6 inches) deep by 15cm (6 inches) wide, before laying out the seed potatoes with the shoots facing upwards. Position the seed potatoes 25-30cm (10-12 inches) apart, allowing 60cm (24 inches) between each row. Cover over with excess soil. 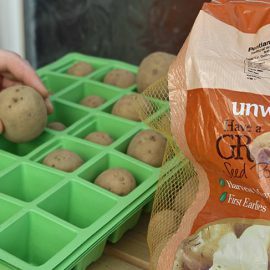 Fill a potato growing bag, or container filled with 15cm (6 inches) of Gro-Sure Vegetable Growing Compost. Position 3-4 seed potatoes evenly on top of the compost, with sprouts facing upwards. Cover potatoes with a further 10-15cm (4-6 inches) of compost and ensure the compost is well watered. First shoots should appear within a few weeks. The first shoots should appear within a few weeks. Once the first shoots begin to show, cover with a new layer of soil. Once the shoots are 5cm (2 inches) tall, cover the shoots with more soil to block out any light. This process is called ‘earthing up.’ Repeat this process twice. Water well, especially once foliage has formed, watering onto the compost, rather than the foliage. When your potato plant starts to flower (roughly 12 weeks after planting) it is usually a sign that your potatoes are getting ready for harvesting. Usually aim to harvest at flower drop or when the foliage starts to yellow. A good guide is that salad crops take about 12 weeks and main crops take about 22 weeks. The longer you keep your potatoes in the ground, the larger they will be and the bigger the yield. Carefully remove the whole potato plant by digging up from the side using a garden fork to avoid bruising. Store in a cool, dark, frost-free place, and wash before use.